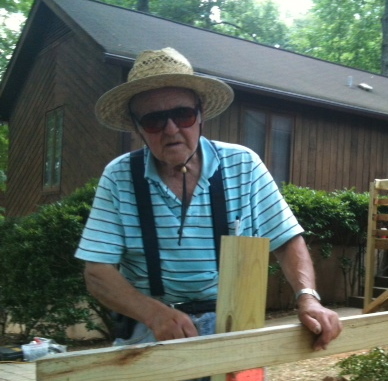 Every Tuesday, Jack Shearin (’50) and his merry band of volunteers spread hope and freedom with treated lumber and plywood. 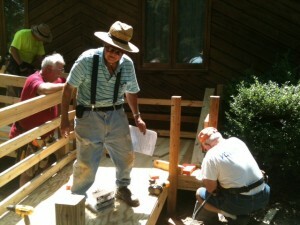 Shearin and a dozen other mostly retired volunteers build wheelchair ramps for the disabled at homes across Forsyth County. They’ve carved out a niche by providing a critically needed, if underappreciated, service, building more than 600 ramps in the last 12 years. In recent years, they’ve built 65 to 80 ramps a year, or more than one a week. Shearin’s crew also includes alumni Bob Edwards (’61) and David Matthews (’62) and another retired mathematics professor, Elmer Hayashi, whose two daughters are Wake Forest alumni. The group, Serving our Savior (SOS), started as an outreach program of First Baptist Church in Winston-Salem to provide general handyman services to those in need. 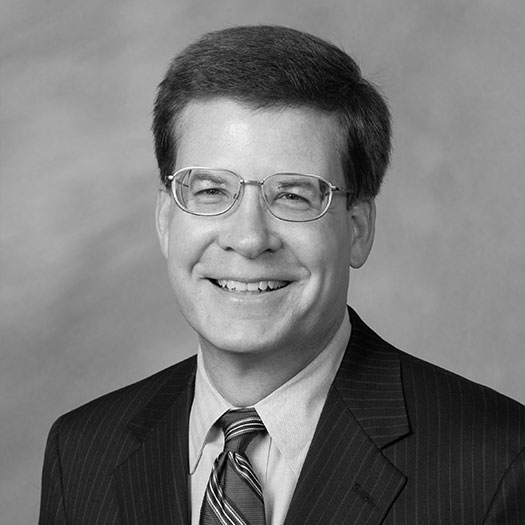 The late John Jordan Jr. (’64) helped found the group, but Shearin became its leader and focused its efforts on building ramps because of the need. It’s now a separate organization with its own nonprofit status. 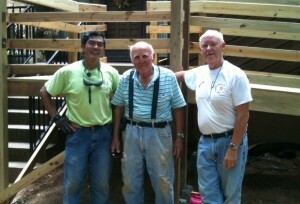 Jack Shearin (\’50), center, with retired mathematics professors Elmer Hayashi and John Baxley. Every Tuesday, that means getting out of bed at 5 a.m. to head to a job site. On a Tuesday in mid-June, Shearin and the other volunteers meet before 7 a.m. at the home of an 85-year-old disabled woman in northern Winston-Salem. The woman had initially hired a contactor to build a ramp at her home, but soon sent him packing because she was dissatisfied with his work. Nothing raises Shearin’s ire quite like an inexperienced contractor trying to build a ramp; it isn’t as easy as throwing down a few boards. It requires know-how that he’s acquired over the years: the slope of the ramp has to be just so; railings, handrails and landings have to be just right. The woman’s daughter and a neighbor had been carrying the woman in her wheelchair down eight steps for weekly doctor’s visits. Unless you’ve been in that situation, you’ve probably never given much thought to a wheelchair ramp, Shearin says. Shearin had already scouted the job and designed the ramp. Constructing it will be time consuming and likely take all day. 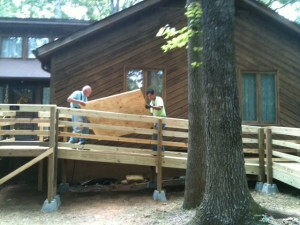 The 48-foot ramp will run parallel to the front of the house with a right-turn down to the yard. They’ll finish it with a sidewalk to the driveway. The job will cost about $1,000 in materials; clients are asked to pay for the cost of materials. SOS spends between $30,000 and $40,000 a year; clients pay about a quarter of that, with the group raising the remainder. 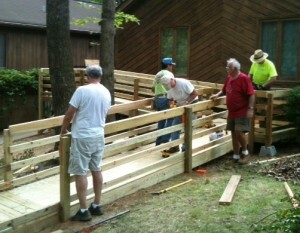 The volunteers work together like a seasoned dance troupe, with each man moving here and there, knowing his part. After being stymied temporarily by an unexpected swarm of bees – quickly dispatched – they dig post holes for the ramp, install support posts, lay down decking and sheets of plywood for the ramp flooring, and then install handrails. Although his doctor has urged him to cut back on some of the more physical parts of the job, Shearin swings a hammer, operates the saw and hauls boards and plywood up the ramp. He takes great pride in putting the finishing touch on the ramp, carefully installing a small black sign noting the group’s work: “Making a difference in the name of Jesus.” The opportunity to make a difference in people’s lives “by helping the handicapped better cope with their disability and to use the gifts that I possess in rendering service to those persons who are less fortunate than I am” are his rewards. As volunteers pile tools and left-over lumber into their trucks and cars, Shearin gets down on his hands and knees to saw off a piece of metal protruding from the house’s front porch where it connects with the ramp. Finishing that, he notices one of the railings on the ramp is not quite right. Let’s fix that, he tells Baxley. 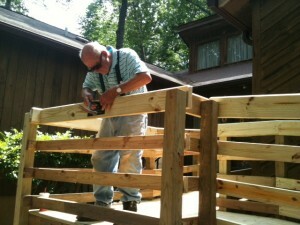 Baxley removes the railing and cuts off a smidgen of the end before replacing it. When asked if he’s a perfectionist, Shearin replies, well, if it’s something that can be fixed, they should fix it. For more information, contact Jack Shearin at (336) 816-0584 or jandjshearin@bellsouth.net.